Reveal lighter looking and fresher feeling skin today. 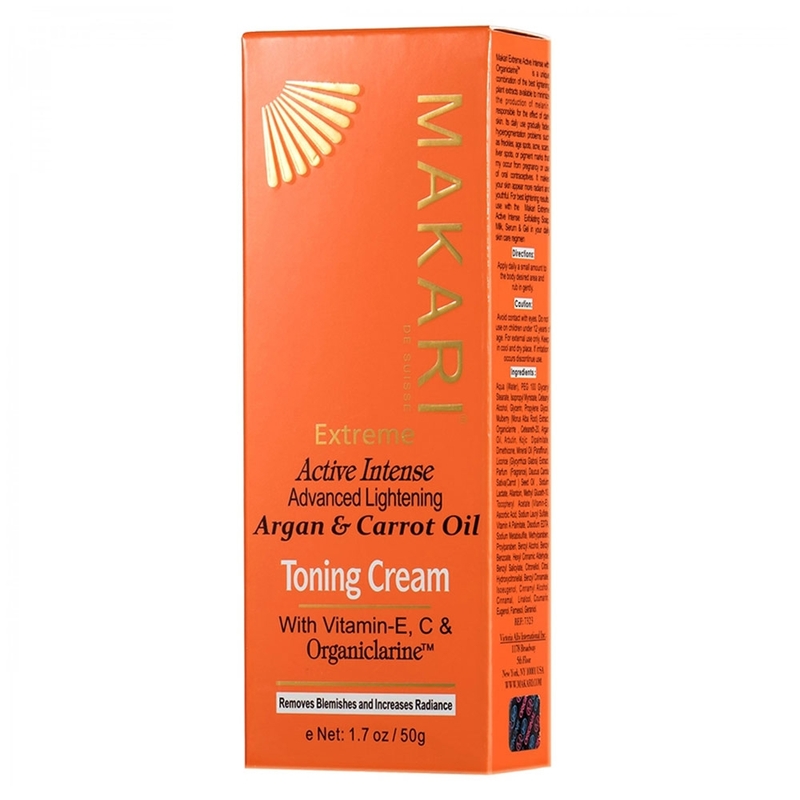 Organiclarine is the only skincare line with Vitamin E and C. Makari Exclusive Toning Cream has gone one step ahead by adding Argan and Carrot Oil to its bundle of skin lightening ingredients. These two most effective ingredients can remove blemishes and lighten your complexion. Together they make a great combination to help you deal with dark spots while leaving your skin hydrated and moisturised. If you are surrounded by skin problems such as freckles, age spots, acne, scars, liver spots, or pigment marks, then Makari Exclusive Toning Cream will help you to fight them without affecting the quality of your skin. Click on the ‘Add to Basket’ now to order from SkinCareTotal. 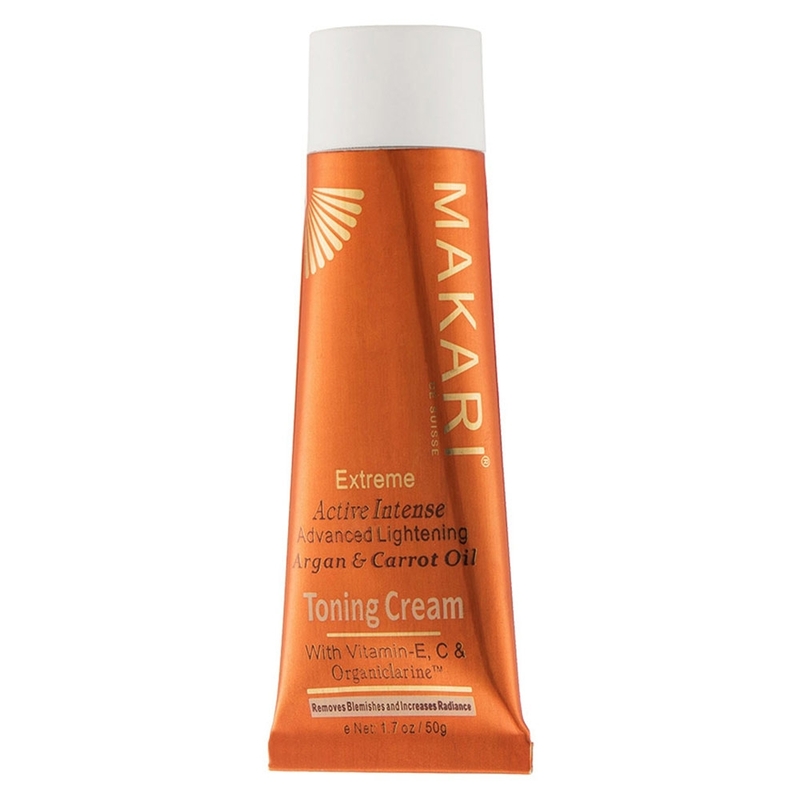 What is Makari Exclusive Toning Cream? Dark skin tone is not bad if you have an even skin tone. But fair skin with blemishes and dark spots is a disaster for your look. Makari Exclusive Toning Cream is a skin lightening and toning cream that helps you to remove blemishes and reveal a lighter complexion at the same time. This cream is specially formulated with Argan and Carrot oil to fight dark spots and work as a perfect moisturiser. It also comes from the only skin care family that contains a natural skin lightening substance called Organiclarine. All the skin correcting properties of this toning cream helps you to experience the beautiful skin. What are the benefits of ingredients? The carefully picked skin lightening ingredients of Makari Exclusive Toning Cream consists of Argan oil, Carrot seed oil and Organiclarine as active ingredients. The other ingredients include: Aqua (water ), PEG 100 Glyceryl Stearate, Isopropyl Myristate , Cetearyl Alcohol, Glycerin, Geraniol, Propylene Glycol, Mulberry (Morrus Alba Root) Extract, Ceteareth-20, Arbutin, Kojic Dipalmitate, Dimethicone, Mineral Oil (Paraffinun), Licorice (Glycyrrhiza Glabra)Extract, Parfum (Fragrance) , Sodium Lactate, Allantoine, Methyl Gluceth -10, Tocopheryl Acetate (Vitamin E), Ascorbic Acid, Sodium Lauryl Sulfate, Vitamin A Palmitate, Disodium EDTA, Methylparaben, Sodium Metabisulfite, Proylparaben, Benzyl Alcohol, Benzyl Benzoate, Hexyl Cinnamic Aldehyde, Benzyl Salicylate, Citronellol, Citral, Hydroxycitronellal, Isoeugenol, Benzyl Cinnamate, Cinnamyl Alcohol, Cinnamal, Linalool, Coumarin, Eugenol, Famesol, Geraniol. Is using Makari Argan and Carrot Oil Cream safe? The Makari products are manufactured after intensive scientific and technical scrutiny with effective skin benefiting natural plant extracts. 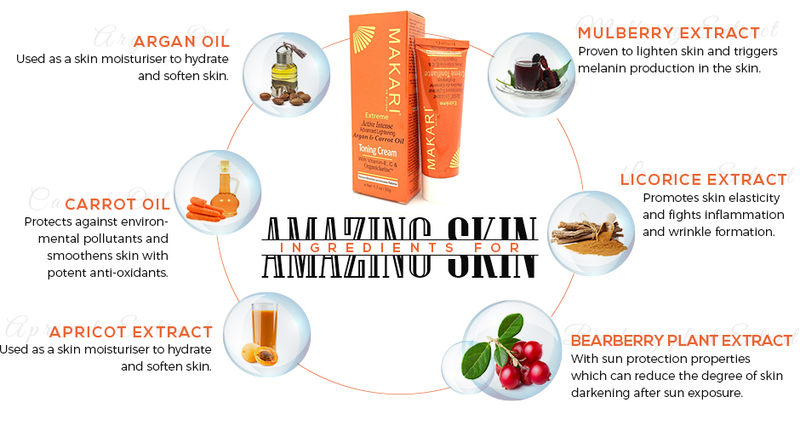 Makari Exclusive Toning Cream comes from Makari’s Skincare line, which contains argan oil and carrot oil for that extra care. All these natural elements make it safe and suitable for all skin types. Still you can look into the ingredients to ensure that your skin is not allergic to any. How do I order Makari Exclusive Toning Cream? You can start fighting back against blemishes and dark spots with Makari Exclusive Toning Cream as early as tomorrow. Yes this is possible due to our prompt delivery service if you order your product before 4:30pm on any working day. Kick-start your skin lightening journey by clicking the 'Add to Basket' button now.